Lie flat on your back with your hands extended above pointing towards the sky. Bend your knees, so that they are at a 90 degree angle. Start the exercise by lowering your right arm and left leg to the floor at the same time. Your leg and arm should just be above the ground – AVOID going to low as this will cause your back to arch. Slowly bring them back up to starting position and repeat with left arm and right leg. ie flat on your back with your knees bent at 90 degrees. Lift your upper back slightly up off the ground. Starting with your right hand, touch your right heel/ankle, then go back to starting position and then use your left hand to touch your left heel/ankle. Bring your heels closer to your buttocks if you cant reach your feet. Sit on the floor, with your knees bent and your feet flat on the floor. Lean back so that your torso is at a 45 degree angle. Make sure that you do not round your back. Hold your hands together -Now twist from one side to the other whilst keeping this position. (ADD in a weight if its too easy). Start in a push-up position, with your hands shoulder width apart. Weight on just your toes. Tighten your core, bring your right knee forward and across your body, with your toes just off of the ground. Return to basic push-up position and do the same with your left knee. Raise your torso and knees so that your body forms a V-SHAPE. Begin the exercise by slowly lowering your body down towards the floor, while at the same time straightening your legs out (They must not touch the ground.) Hold this position for 2 seconds and return to starting position. Lie on the ground in a crunch position. Press your lower back into the floor and pull your belly button to lift your feet off of the floor. Keep your knees together, bent at 90- degree angles. Once in a stable position shoot your legs up, keeping them straight. Hold this position for 2 seconds then slowly lower yourself back to starting position. 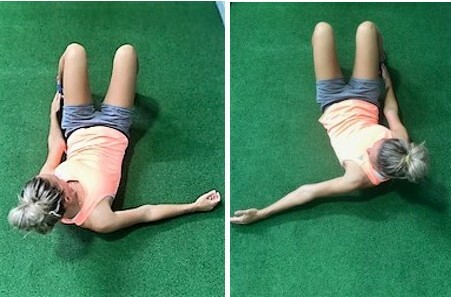 Lie flat on your back with your arms and legs straightened. Slowly lift your feet up off the ground without curving your back. Keep your legs straight now lift your legs up and down for 30 seconds. Lie on your back in a traditional crunch position. Lift your legs up off the ground and bend them at 90 Degrees. Slowly lift your torso up off of the ground and imagine that you are pulling a rope towards you. Pull the rope 60 times. Start in a push-up position, with your hands shoulder width apart. Weight on just your toes. Tighten your core, now with your right hand touch your left shoulder. Then with your left hand touch your right shoulder. Keep your body as straight as you can. Sit on the floor with your legs extended straight out in front of you. Hold your arms straight out in front of you with like you are holding your hands together. Using your hands touch your right side then back to centre and then left side. That counts as one full Rep.